The United States announced this week that it would begin refurbishing its nuclear missile systems, an overhaul that is estimated to take roughly 20 years to complete, in a direct response to the upgrades made to the nuclear capabilities of Russia, China, and North Korea. And it did not push aside fears of a looming World War 3 when Defense Secretary Ash Carter made a speech at a nuclear missile silo this week where he called upon NATO (North Atlantic Treaty Organization) members to “refresh their nuclear playbook.” In what looks to be nothing short of a re-establishment of the Cold War, events appear to signal a return to the days of nuclear weapons deterrence policies and the constant fear of some state player triggering World War 3. As Agence France Presse (AFP) reported earlier in the week, the U.S. has plans to switch out over 400 intercontinental ballistic missiles in the next two decades, completely replacing the Minuteman III nuclear-tipped missiles now in secret silos across the U.S. with an as yet unnamed modern missile system. It is part of a refurbishing program of the military’s “nuclear triad (missiles, submarines, and bombs),” and its estimated cost is around $1 trillion, spent over the next 30 years. “The Russians, the Chinese, the North Koreans are upgrading all of their systems,” an Air Force official, speaking on condition of anonymity, told AFP. He went on to say that since the other powers were “upgrading all of their legs of the triad,” he did not believe that “in that environment, I am not sure it makes sense” to do nothing. The Minuteman III missile system has been in place since the 1960s (some of the missiles and silos since the 1950s). As another Air Force official noted, a number of the vendors who constructed and equipped the nuclear weapons silos have gone out of business over the years. Finding replacement parts have become extremely difficult, so some type of refurbishing operation was in order. But the modernization of the nuclear weapons of the U.S. would not in itself prompt fears of World War 3 and a multinational war that could lead to a potential nuclear exchange. Proper maintenance of war ordnance is as much a nod to safety as it is to preparedness. The political rhetoric that followed did. Speaking to a group of “missileers” — Air Force airmen who handle the operations of land-based nuclear weapons — at Minot Air Force Base in North Dakota, Secretary of Defense Ash Carter stated, according to the Daily Star, that Russia was as much a “loose cannon” threat to global security as North Korea with regard to Russian President Vladimir Putin’s emphasis on a resurgent Russia. Talk of a limited nuclear exchange in a constrained or localized war setting has become a point of acceptability of late, a tone that sparks fears in the hearts of those who would avoid World War 3 scenarios at all costs. With think tanks like the Atlantic Council, as reported by the Inquisitr, warning that Russia could invade and take over the Baltic States in a matter of days “with no warning,” fears that Russian military officials might resort to such nuclear tactics have proliferated. And then there was recently retired NATO Supreme Allied Commander Gen. Breedlove, who warned the NATO nations, according to a separate Inquisitr report, that they were woefully unprepared for a concentrated Russian attack, that a sustained military offensive, coupled with Russia’s air and naval superiority, could potentially see Russia in control of helpless Europe with the Atlantic Ocean as a patrolled buffer zone to keep the U.S. and Canada from providing assistance. World War 3 sabre-rattling is nothing new between Russia and the United States, of course. The two superpowers have played the game of nuclear brinkmanship since shortly after 1949, when Russia detonated its first atomic bomb. Although the end of the Cold War and the break-up of the Russia-dominated Union of Soviet Socialist Republics saw a lessening of tensions between the world’s two foremost nuclear superpowers, the rise of the Russian Federation under the leadership of Vladimir Putin has brought all the militarization and political posturing back into play. And as AFP pointed out, Russia has already begun re-outfitting its nuclear triad. The United States has apparently decided that continued Russian military aggression in various parts of Europe and the Middle East over the past few years has reached a point where nuclear weapons deterrence rhetoric must now become part of dealing with Russia — again. And so, too, must a commitment be made to the modernization of its nuclear defense capabilities. But a nuclear stand-off, at least to a great many, is a far better alternative to limited nuclear exchanges, or worse, the nearly assured destruction of the planet should World War 3 be waged with nuclear weapons. It was an unmistakable warning — but Rear Admiral Steve Parode says there’s no indication the Russian military has changed its thinking about nuclear weapons. David Shlapak of the RAND Corporation directed a series of war games commissioned by the Pentagon in which Russia invaded the Baltic states of Estonia and Latvia — two of the newer members of NATO and because of their location on the Russian border two of the most vulnerable. Hans Kristensen: It can – it sinks into the ground with the weapons, levels completely with the surface. War mongering in India is running high and its government reportedly is considering localised military action to teach Pakistan a befitting lesson for its alleged cross-border terrorism. Pakistan is bound to respond in equal measure and according to Stephen Cohen as reported in New York Times recently, ‘the conflict could skid into a nuclear conflict,’ adding it would be devastating for both the countries. War hysteria in India this time is fuming with vengeance enough to cross the red-lines. Its probable eventuality gets credence in the wake of recent Uri attack in IHK, earlier Pathankot terrorist attack and Mumbai carnage, and Pakistan government’s inordinate delay to bring the culprits to justice. It is hoped that better sense will prevail on Indian government led by Prime Minister Modi that has been desperately trying to build up its leadership mettles by bringing in economic prosperity in the country. They must not be carried away under the pressure of hawks who have increasingly taken the central stage in the corridors of power of India and in the country’s media alike. Surprisingly, Indian prime minister’s last week’s Saturday public address opting for isolating Pakistan globally rather than crossing the swords, was a positive development to stem the tide of the possibility of the armed conflict between the two countries. Overwhelming majority of people in Pakistan and India as well took the sigh of relief over the resultant shattering of war clouds as the unleashing of the of war instruments could have inevitably left the two countries crying mutual havoc afterwards exemplifying all pains no gains. In this backdrop generated by India, Pakistan prime minister should immediately give heed to the sane proposal of ANP Chief Asfandyar Wali suggesting him to summon the joint session of Parliament to discuss the state of deteriorating relations, to the lowest ebb, between two neighbours for the formulation of a national response to ward off imminent threat that may lead to armed conflict. Its indispensability cannot be overemphasised at a time when possibility of Indian retaliatory military action inside Pakistan is flying thick and fast. The joint session of the Parliament will send a powerful and detrimental message to the bellicosity of India, and to the world community of Pakistan’s endeavours of averting the conflict in the face of India’s jingoism. Such message emanating from the Pakistan Parliament is bound to have desirable impact qualitatively both on India and the world at large. The proposed session of the Parliament will also suggest to the government the road map of de-escalation of prevailing tension between the two countries leading to renewed efforts for normalisation. For this, an all parties’ parliamentary delegation may be constituted to activate diplomatic efforts assuring India of Pakistan’s commitment to bring terrorists of all hues to justice as a shared priority. Pakistan’s crying horse as victim of terrorism has been increasingly losing its appeal in the world. Its incredible successes against terrorism are also subjected to the diminishing return because of the widely held perception that Pakistan’s ubiquitous security establishment has been playing on the both sides of the street so far as good and bad terrorists are concerned. It is no more plausible because the international community’s patience is brimming out with frustration as Haqqani network’s presence on Pakistani soil glaringly runs counter to the stated policy of Pakistan. This contradiction had invited all out opprobrium. Its fight to defeat terrorism in its all forms and manifestations is deemed as flawed. It is hard to find any taker of this covert policy of Pakistan notwithstanding colossal losses, both in blood and treasure, in the war of terror. It is ironical because the world is skeptical. Two big and prominent proscribed outfits, also on the UN terrorist list, are big source of embarrassment for Pakistan as they take out processions in major cities in the full glare of media. The government’s inaction under NAP speaks volumes of its either double speak or lying in spine before them intimidated and terrified having no audacity to control them. This display of outlawed organisations is under the scrutiny of the international organisations and the media. The state of affairs also explicitly points to the civil-military disparate because civilians consider them as delinquent liability and the military as its Trojan horse. It also purportedly implies that elected government cannot take them on in favour of paradigm shift fearing reprisal from their patron leading to destabilisation enough to endanger the longevity of the government of the day. The credibility of the government and its institution will not be restored till the bull is not taken by horns in front of the full gaze of the world. Ironically, the establishment not presumably jettisoned, overt and covert, proclivity of controlling the security/foreign policy to the much exclusion of the civilians and their representatives, Parliament, notwithstanding the history of devastating denouements of this type of pursuit in the form of secession of the federation, sprawling of extremism and terrorism, Kargil debacle, Indian clandestine occupation of Siachin, privatisation of the security/foreign policy through proxies etc. Senator Farhatullha Babar has dwelled upon this self-defeating tendency at various public and parliamentary forums at number of times but no avail. A combined article written by three former distinguished foreign secretaries and the security adviser, published on the front page in the local English daily, have blown the whistle urging the government to take immediate and bold initiatives to defuse the situation by improving relations with Afghanistan as its top priority followed by with other neighbours. Thanks for the immensely valuable and timely advice to the mandarins that should sink well with them. The opinion of such distinguished personalities should be taken with matching seriousness preceded by tangible steps in the direction as suggested by them. Government in Kabul must be assured in absolute terms of not allowing Afghan Taliban in Pakistan to use its soil to perpetrate terrorism in the country. The drive against the Afghan Taliban network should not only be carried out by Pakistan but also be seen to be carried out. Pakistan has no choice but to abandon Taliban of all hues if it wants the world to believe in its commitment to defeat terrorism indiscriminately. The echoes of betrayal and duplicity, US Congress, are too loud now in the world capitals enough to shrill nation’s ears. The chances of getting benefit of doubt are almost nil, be aware. Even man of ordinary prudence will conclude the grotesque aftermaths of proxy wars. The presence of Afghan Taliban on Pakistan soil gives credibility to the Indian allegations of the currency of cross-border terrorism. Afghanistan leadership blames Pakistan for all its predicaments attributed to this policy of good and bad terrorists. Tragically, activities of the proscribed organisations under the open sky of Pakistan had also hurt the struggle of the Kashmiri people for independence as they flaunt their role in the uprising against the Indian occupation of the Valley. They were helping India who projected it as a terrorist movement rather than legitimate struggle focused to the right of self-determination. The Uri terrorist attack recently gave India much fodder to divert the attention of the international community at the expense of the freedom movement. It was enough to confuse the international community, and the Indian diplomacy was on the overdrive to put blame of cross-border terrorism on Pakistan. The incident overshadowed the Indian atrocities in held Kashmir at a time when UN General Assembly was in session. No country can afford to endorse the presence of Afghan terrorists on Pakistani soil. The rest of the world is increasingly coming closer to tell Pakistan on its face ‘enough is enough.’ In the US, the Congressmen are raising their voice against Pakistan alleging the country has proved as unworthy ally and US money cannot be spent to reward ‘betrayal and duplicity’. President Obama had also candidly urged Pakistan, ‘to move pro-actively and sincerely to delegitimise and dismantle the Haqqani network.’ The US Security Adviser Susan Rice during her visit to Pakistan also made it quite clear that Haqqani network had to be dismantled if Pakistan wanted the US economic and military assistance. The rejection of US aid to Pakistan clearly suggested that there were no free lunches. In the recent meeting of prime minister of Pakistan in New York with John Kerry, cross-border terrorism figured quite prominently. Pakistan stands no chance of standing on its feet in the diplomatic and economic fronts if US’ annoyance culminating into choking reprisal in myriad fronts. As such, the wheels of diplomacy should move swiftly based on paradigm shift and unflinching sincerity to turn the tide of looming disaster. The parliamentarians should display guts and take the charge of the foreign/a security domain which is their legitimate right conferred on them by the people of Pakistan. Their ambivalence in this regard will cast shadow of pusillanimous explicitly implying not worthy of representing the people. The imposition of institutional pontification in this regard should be relic of the past that is known for inflicting curdling nightmares. William Lambers is the author of Nuclear Weapons and The Road to Peace. His writings have been published by History News Network, Huffington Post and Spectrum, the official magazine of the Comprehensive Nuclear Test Ban Treaty Organization. The President should use this historic opportunity to build support for the global treaty ending nuclear weapons testing. The Comprehensive Nuclear Test Ban Treaty (CTBT) is the key to unlocking the door to a future without the crushing burden and fear of nuclear weapons. But the United States, Israel, China, Egypt, India, Pakistan, Iran and North Korea have yet to ratify the treaty. So it has not taken effect worldwide. It just sits waiting for leadership to act. Most notably is the absence of the United States, the leading nuclear power. During the Cold War nuclear weapons testing by both the United States and the Soviet Union proliferated, causing major international tension. President Dwight Eisenhower, in his second term, was influenced greatly by his science advisors that a ban on nuclear testing was possible and essential for national security. Eisenhower, in a 1961 interview with Walter Cronkite, said that not achieving a ban on nuclear testing would “have to be classed as the greatest disappointment of any administration — of any decade — of any time and of any party.” He thought it was vital to take the expensive burden of nukes off the backs of mankind. Ike’s efforts helped lead to a limited treaty signed by President Kennedy in 1963 banning nuke explosions in the atmosphere, underwater and outer space. It had the support of both Republicans and Democrats. In fact, Eisenhower administration members worked to help Kennedy achieve passage of the treaty in the Senate. But with underground tests allowed to continue the treaty was only a stepping stone. We have not yet taken that crucial next step. The Republican Party, which had done so much to advance the cause of ending nuke testing, turned against it in that Senate vote. This was a major blow for nuclear arms control, disarmament and peace efforts. Today, the United States and Russia still have thousands of nukes each. And China, India, Pakistan and other nations are well armed with nukes. With no treaty in effect, nations could resume testing nukes at any time. This would cause a major arms race. The risk of nuclear terrorism or accidental launch make nuclear disarmament a very crucial goal for all nations. Then there is the cost. Global Zero estimates that nations will spend a trillion dollars on nuclear weapons over the next decade. How can we justify pouring money into these weapons when there is so much hunger, disease, and poverty? These issues threaten stability more than anything. Look at the massive number of refugees around the world. We can’t ignore their plight. So all nations share a common interest in getting the burden of nukes off their backs. But reducing nuclear weapons is not something you achieve overnight. You have to build confidence in the process. The Comprehensive Nuclear Test Ban Treaty is a step that the United States can take now. The Republican led Senate could show leadership for peace and ratify the treaty. President Obama would sign it. The International Monitoring system of the treaty has detected all of North Korea’s nuclear tests. There are stations all over the globe, so it becomes extremely difficult, if not impossible, for a nation to cheat. Japan wants to work with the United States on ending nuclear testing and building a world with no nukes. 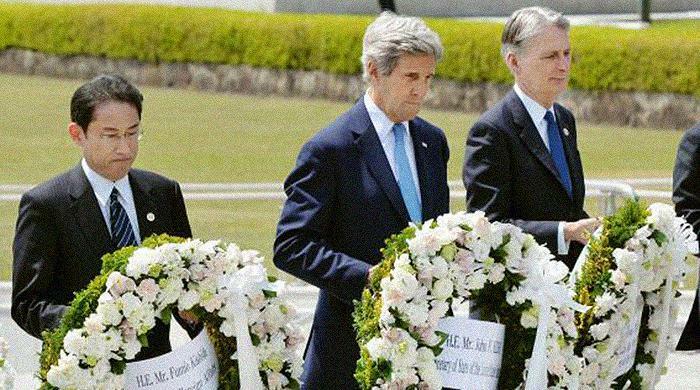 The visit by President Obama to Hiroshima this week is a fantastic opportunity to invigorate this peace movement. Japan and the United States, once at war, can now walk together in peace. What more fitting than for the two nations to lead a global movement to eliminate nuclear weapons. The right place to start would be to end nuclear testing by ratifying the Comprehensive Nuclear Test Ban Treaty. Dr. Ira Helfand, recipient of the 1985 Nobel Peace Prize, discussed the impacts of nuclear conflicts and ways to prevent nuclear escalation on Monday. The physician is also the co-president of the International Physicians for the Prevention of Nuclear War and co-founder of Physicians for Social Responsibility. Many young people are “profoundly” uneducated about nuclear weapons, according to Helfand. The physician showed a video, that won first prize in the student category for the Nukebusters 2015 Short Film Contest, which demonstrated how disturbed students are when they hear about nuclear weapon capacity for damage. Helfand argued that this lack of education is dangerous because it translates to complacency among the next generation of potential anti-nuclear proliferation advocates. Helfand also described the social impacts of a nuclear conflict — including radioactive contamination, a disruption the global climate with smoke and soot — all of which he said could contaminate in human extinction. This mass destruction could also result from the degradation of food production throughout the world, according to Helfand. Large drops in temperature, due to a nuclear fallout, could wreck havoc on food staples like corn in the United States and rice i China. The consequences of nuclear conflict would be global, Helfand said. If a nuclear conflict between India and Pakistan occurred, China’s Guangdong province, thousands of miles away, would see its rice crops fail completely within a year, and its 37 million residents would starve, according to Helfand. The scarcity of food could also lead to global hoarding by countries who export food, placing other countries, who already struggle feeding their people at greater risk of famine, according to Helfand. He said these inflated food prices could last for decades. By recent estimates, there are almost 795 million malnourished people in the world, he said. “All of these people would be at terrible risk if there were a 10 to 30 percent decline in the food available to them,” Helfand said. Shocks would also harm the 300 million people who live in countries that import food as well as many others who are not rich enough to pay inflated food prices. Additionally, nuclear radiation would cause dire health problems and there would be little available treatment, according to Helfand. With impacts this great, Helfand stressed that stopping the escalation of nuclear weapon must be made a political priority. Several steps, such as taking U.S. nuclear weapons off high alert, eliminating tactical nuclear weapons and ratifying the Comprehensive Nuclear Test Ban Treaty would have immense significance in creating a nuclear weapon free world, accoring to Helfand. Helfand ended the discussion by urging public engagement in ending the reliance on nuclear weapons. “I challenge everyone who is not already involved in this issue to figure out how on this campus you build a movement that helps to educate the general public and our decision makers about the dangers we face, the possibility we have for eliminating that danger, and the urgency in doing so to avoid this catastrophe,” he said. Helfand’s lecture was co-sponsored by the Judith Reppy Institute for Peace and Conflicts Studies, the Center for Transformative Action and the Episcopal Peace Fellowship and organized by the Mario Einaudi Center for International Studies.